An Abstract of Title is a summary prepared by a licensed abstractor of all documents recorded in the public records of the County Clerk and Court Clerk where the land is located. In Oklahoma an abstract is reviewed by an attorney to determine the marketable condition of the title.  At Creek County Abstract we provide actual instrument copies of the records when possible rather than an abstract page of the recorded instrument. How do we keep track of all these records? Each document is indexed according to the standards set forth by Creek County and the State of Oklahoma. When Creek County Abstract started doing business in the fifties, documents were indexed by pen and paper. Now, Creek County Abstract uses state of the art scanning and indexing system which allows infinite storage space, lightning fast document recovery and a backup copy of our title plant. What does this mean for you? An abstract that is delivered quickly and accurately saving time and money. How long does it take to update an abstract? Once we have located the abstract for your property, the update normally takes five (5) to ten (10) working days. In the event the abstract has never been made or has been lost or destroyed we can build an abstract from inception. It normally takes twenty (20) working days to collect and assemble a complete abstract of your property. Please enter your full legal description of the property you wish to have us search. Please fill out contact information, property address, and legal description of the property to be abstracted.